I’m back in Baltimore, and after some cat-snuggling and email-answering it was time to head out on the bike. Oh, Surly, I missed you! We made a quick stop in the neighborhood for a sandwich before heading down the hill and taking a right on Gay Street for a slow trip through the abandoned Old Town Mall. This place is just a few blocks off the main downtown drag, but it might as well be in, well, east Baltimore. I snapped this picture while pushing my bike along, and it felt like a ghost town. I idly wondered if they might make this an Ole Tyme Ghost Town or Colonial Williamsburg-type tourist destination–what’s the difference? Or will it someday be that–urban disaster tourism, a la New Orleans? I continued along, saying my how-you-doins (I missed those–the west coast doesn’t share this neighborly ritual) and noting the couple of storefronts that have managed to stay open, and then I was back on a bike lane and pedaling along through east Baltimore and down to Fells Point to stare at the water and then heading to O’Donnell Square for frozen yogurt before heading home through Patterson Park and back up the hill. It just felt good to be out there and on the bike, good to be home. I really, really like this place, from the parks and bike lanes to the Old Town Malls–all of it. 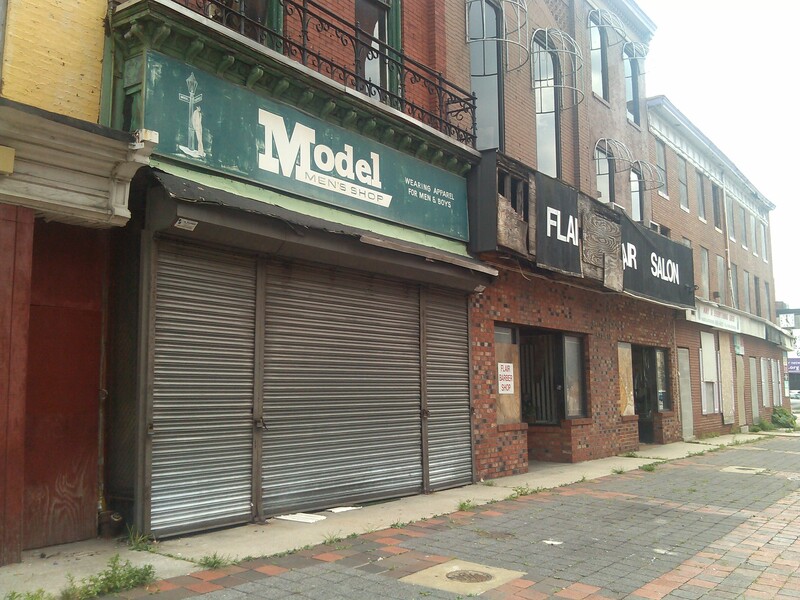 This entry was posted in blight, neighborhoods and tagged Baltimore, Cantonm O'Donnell Square, Fells Point, Old Town Mall, Patterson Park. Bookmark the permalink. Ahh, but we miss you out West.